The S&P 500 finished the month of January today, rising 7.87% and recording the 5th strongest January on record since 1950 (and the best January since 1987). Nearly all of the popular “January barometers” are checking the bullish boxes, and sentiment has swung from December’s “over-invested and panicked”, to January’s “under-invested and nervous”. The last two months illustrate a phrase I use all the time when interacting with prospects and clients - the price of the S&P 500 will trade beyond the limits of human imagination. The last two months are yet another perfect example. Few can probably even imagine what lies ahead. So, if the message of the market in December was “we’re doomed”, and the message of the market in January was “Psych! Just kidding!”, what on earth lies ahead? The nasty thunderstorms I wrote about in my last post came to fruition in December (no, I didn’t think we’d crash in December), but at least it has stopped raining for the moment (and ironically, it’s supposed to rain in San Diego the next 4 days, our version of the polar vortex). The trillion dollar question is, what’s next? More rain, thunder, lightning and nastiness, or are the clouds clearing and the sunshine is ready to resume? Let’s have a look. While January was an exceptional month for the S&P 500, it recorded as just an “inside month”, albeit the highest returning “inside month” the S&P 500 has ever recorded. However, “inside months” stand for indecision, or hesitation, in the actions of market participants. Behaviorally, no transactions took place at or around the prior month’s high and low, and the most critical levels of support and resistance were never probed. It’s from these lenses that January can’t possibly be an all-clear sign. While I can state that the December rain stopped in January as the S&P 500 plowed through any and all plausible levels of resistance it encountered, I can’t state the sun is back out. One month does not a trend make, the S&P 500 hasn’t recorded consecutive monthly bars of the same color since September. Interestingly, gigantic “inside months”, defined as an “inside month” paired with a monthly return of 3% or more for the S&P 500, have generally been a negative omen over the forward 4 months. And ironically, the last gigantic “inside month” we recorded just so happens to be January of 2001. The S&P 500 would shed -15.06% just two months later. No, I don’t believe this is what’s ahead over the coming two months, but given the parallels between 2018’s price action and the year 2000, this should keep any and all complacency in check. There are 16 prior gigantic “inside months” since 1950 for the S&P 500, and four months later the index has closed lower 10 of 16 instances for average/median returns of 0.64%/-1.49%. If we zoom in on the above samples for additional context, we can focus on those samples that demonstrated negative momentum. That is, not all gigantic “inside months” are created equal, and a gigantic “inside month” where the S&P 500 is higher over the trailing 1, 3, 6, and 12 months should probably be viewed differently than a gigantic “inside month” that occurs with the S&P 500 lower over the trailing 1, 3, 6, and 12 months (negative momentum). Here is what’s left when filtering by negative momentum. 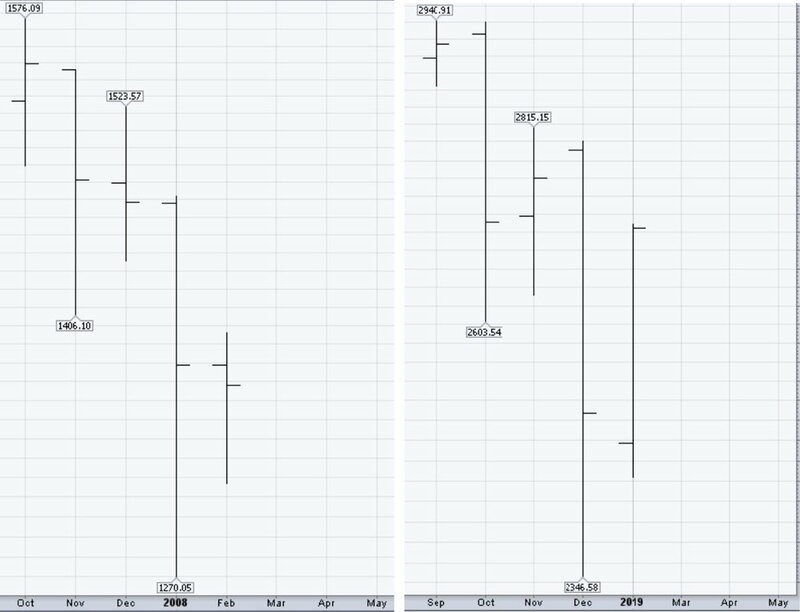 All samples saw the S&P 500 close lower 3 months later, and 4 of 5 samples saw the S&P 500 trade lower by -16.15% or more at some point over the forward 1 year. A -16.15% drawdown from January’s close is suggestive of a trade down to ~2,267.38. Imagine that? Now, it’s important to state the obvious: there’s nothing predictive or significant that we can take away from just 5 prior samples. This alone is not a reason to park your portfolio in cash, but it is something that at the very least should be considered before an investor thinks now’s the time to start swinging for the fences. The 62 mph fastball was on 12/24, and the pitches are much harder to hit from here. There’s a curveball coming, there almost always is. We’ve seen this 5-month pattern occur exactly one other time since 1950 for the S&P 500. When, you ask? Try October 2007 through February 2008, the last time the S&P 500 topped. Of all the 5-month patterns we have since 1950, it just has to call out those 5 months? Fascinating. We also saw 2019 record as a Whaley bearish Turn of The Year (TOY) (to read all about TOY, click here). Whaley bearish TOY years have had success at plucking out the worst of calendar years since 1950. 2019 records as the 16th bearish TOY on record, and 10 of the prior 15 saw the S&P 500 close lower one year later for average returns of -5.50%. With 1/18’s close at 2,690.73, TOY would suggest a placeholder at 2,542.73 on 1/17/2020. Additionally, TOY’s weakness generally occurs through the “unfavorable” period for stocks, the May through October time period. During bearish TOY years, the S&P 500’s cumulative returns from April’s close through October’s close has been lower 12 of 15 times for average declines of -7.83%. But Steve, how about that January counterpunch? Looking back at the table above, I’d be remiss in not pointing out the most recent bearish TOY was 2016, and that turned out to be a fantastic year for the S&P 500. I can remember January and February 2016 like it was yesterday, and the uncertainty at that time was as high as it is right now. The S&P 500 was a coiled spring, positioned for a substantial move one way or the other. Personally speaking, I was convinced we were going to trade meaningfully lower in 2016, at least temporarily, perhaps down into the 1,600s - and boy, was I wrong. Given the luxury of hindsight, we know the skies cleared and the sun came out. Following March of 2016’s advance of 6.60%, the S&P 500 would go on to rise 24 of the next 30 months, and gain 41.09%, before plunging -6.03% in October of 2018. I share this not because it’s predictive of what lies ahead, but because the best of returns for the S&P 500 often come from the darkest of times, the nastiest of climates. The bearish case is always the most articulate case, and therefore often the most convincing, since it deals with what’s known and knowable. The bullish case always requires a leap of faith, and it’s imperative investors remember that anything’s possible, which is what 2016’s U-turn teaches us. Yes, there is a chance we’re onward and upward from here, no matter what I’ve previously shared in this post. Therefore, we all should at least be prepared for this possibility, no matter how unlikely it may seem at the moment. So, January’s surge was impressive, even to the staunchest of Zerohedge readers. From price momentum, to breadth thrusts, to monetary policy, January was a damn near flawless counterpunch to December’s weakness. Fundamentally speaking, the Federal Reserve is now out of the way. While this is probably an indictment regarding the health of the economy, it does remove an element of uncertainty as participants collectively attempt to discount the future. Chairman Powell folded like a cheap suit in January, which makes his December testimony that much more inexplicable. Federal funds futures probabilities are now forecasting no further rate hikes in 2019, and a growing possibility of a rate cut in January 2020. “This is the period in the four year election cycle in which if you are interested in getting reelected, one would be best served to get their act together”. Per Wayne’s study below, from January’s close through April’s close in pre-election years, the S&P 500’s higher 17 out of 17 times for average/median returns of 6.51%/5.44%. Something tells me there’s a very good chance the sequel to the shutdown and the “trade war” are coming to their end. Finally, if we define January as a calendar month that gained 5% or more, but was still lower over the prior two calendar months, it joins a who’s who list of favorable market climates over the forward 6 and 12 months. There are only 8 prior samples of this occurring, but all 8 saw the S&P 500 close higher 1 year later. Further, all 8 saw the S&P 500 close a calendar month higher by at least 8.10% over the forward 1 year. A monthly close 8.10% above January’s monthly close would target a calendar month close at 2,923.13 at some point over the forward 12 months, and that’s a slightly higher all-time high monthly close. Now, the forward 1-year range following this two-month pattern is not without volatility, and it would be suggestive of a trade down to ~2,440.99 and a trade up to 3,353.35 at some point over the forward 1 year (and not necessarily in that order). I’m most interested in the idea of the drawdown coming first, because that will quickly turn this “V” into a “W”, since every “W” begins as a “V”. This also matches the short-term weakness that generally has followed gigantic “inside months”, along with the drawdown that tends to occur during bearish Whaley TOY years. Psychologically, those participants who did buy at and around 2,346, or January’s low at 2,447, all wish they bought more. Those participants who didn’t buy at and around 2,346 or 2,447, now wish that had. Therefore, if we do happen to trade back down towards 2,440 over the months ahead, I imagine participants will buy that dip with a vengeance, even if a slightly lower low comes about. Now’s not the time to be a hero with your asset allocation. Long-term investors are best served balancing their needs of participation and preservation. Perhaps i’m most certain in the idea that there will be far better pitches to swing at into the future. Patience mostly pays.